Lockheed Martin has partnered with RedEye to produce test versions of satellite fuel tanks. Engineers have used 3D printing to craft a pair of large space fuel tank simulators in order to test key satellite components, the latest feat for additive manufacturing in the spacecraft industry. The two new fuel tank simulators were made by the rapid prototyping company RedEye for Lockheed Martin Space Systems as a way to validate satellite design. The larger of the two tanks measures 15 feet long (4.6 meters), making it one of the largest 3D manufactured items that Lockheed and RedEye have ever made. You can watch a video of the fuel tank 3D printing process. 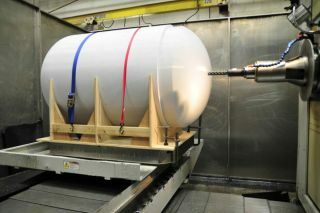 "This project is unique in two ways — it marks the first aerospace fuel tank simulation produced through additive manufacturing and is one of the largest 3D printed parts ever built," Joel Smith, RedEye's strategic account manager for aerospace and defense, said in a statement. "Our ability to accommodate such a large configuration and adapt to design challenges on the fly, demonstrates that there really is no limit to the problem-solving potential when you manufacture with 3D printing." The tanks were manufactured from polycarbonate material. In total, it was about half as expensive to use the 3D-printing method as it would have been to manufacture the parts. In the future, Lockheed could use the process to its advantage when bidding for space parts, company representatives added. "The goal was to design a satellite that would make more efficient use of space and increase the satellite’s payload," Lockheed representatives said of the 3D-printed simulators. "It would require testing many assembly configurations and producing several simulators and prototypes to validate design changes. One change that needed to be validated was in the satellite's fuel tanks." The simulator was required to test how best to put the actual fuel tanks together, and 3D printing was seen as the best choice to meet a tight deadline and contain costs. Lockheed Martin has partnered with RedEye to produce test versions of satellite fuel tanks. The project team stands with finished tank simulations. 3D printing is becoming more common for manufacturing things in space, and this summer a 3D printer will launch into space for the first time on a mission to the International Space Station. Some experts say 3D printing will help future lunar or Mars colonists manufacture materials on site.